Don’t ask me why I ended up with a dead beaver. Let’s just say that I did and that it was legally obtained. I skinned it and processed it, as per fur trade tradition, but I also gave it a good visual once over before doing so. I’d like to share some of this “once-overing” with you and – according to my own tradition – show you some things you probably didn’t really want to see. You can consider this your indoctrination into the “Beaver Club.” Now, stop snickering, this is a good thing. Beavers are fascinating creatures that well deserve the centuries long human attention paid them. There is no telling of the history of Canada or of the Northeastern United States without mention of this fur bearer and it’s essential and political role in nation building (and destroying). Once upon a time you were considered a nobody unless you were a member of the Beaver Club. 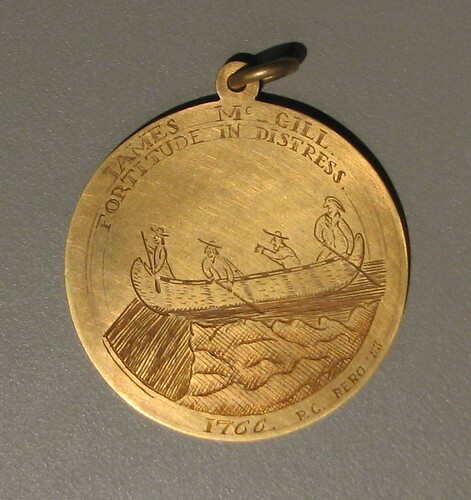 High profile members of the fur trade such as James McGill or the Mackenzie clan were once members of the esteemed beaver club in Montreal (see medallion below and a club plate here). So, you see, the idea of gaining Beaver knowledge is not all that odd. Beaver, more properly known as Castor canadensis, are becoming more common in Southeast Michigan – a place that they have not been for the better part of 150 years. Here in the Detroit River region these animals were literally located in the epi-center of the fur trade and were regionally trapped out long ago. Although common elsewhere, their re-appearance here has only slowly advanced over the past ten years or so. Getting a good close look at one of these giant rodents is time well spent. While I’ll spare you the whole body shot of the animal, the creature I examined was around 32 inches long and probably weighed in at about 20 pounds. Judged by normal beaver standards, this guy would be considered small. One hundred pound beavers are not unheard of and it is no wonder that they rank as the world’s second largest rodent (behind the Capybara). The tail is the one single beaver feature that everyone seems to know about. I mean, you can ask the average pre-schooler to draw a beaver, or ask them to describe the beaver’s tail, and they’ll tell you that it is flat with “checker” marks on it. The above average pre-schooler will go on about how the beaver uses this scaly appendage for swimming and spreading mud on it’s darn (they shouldn’t say dam). The obnoxiously brilliant pre-schooler will tell you how the beaver will slap the water with its tail as a danger signal and that the early fur trappers considered this part of the animal as a delicacy. In order to bring us all up to the level of a pre-schooler, I present to you the tail in question (see below). 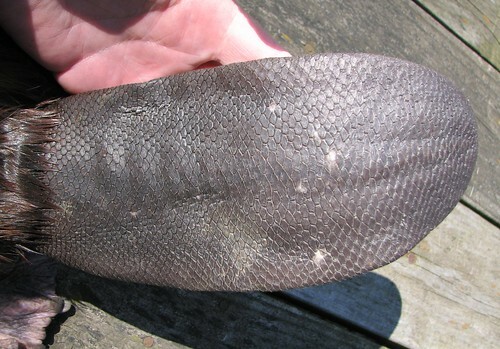 The large paddle-like tail is indeed flat and “checkered.” About 1/2 inch thick (see here), the skin portion of this particular tail was about 8 inches long by 4 inches in breadth. The musculature extends into the body and much of the beaver’s rump beyond the hips is actually fur-covered tail. 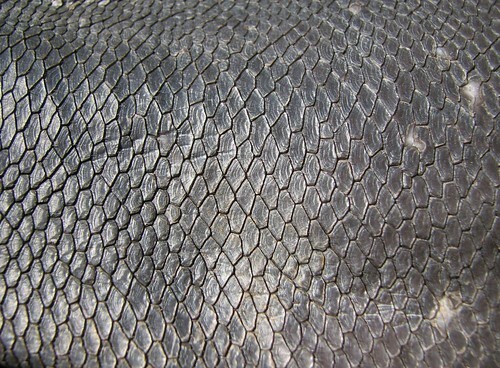 An irregular set of scales cover the surface (see detail shot in beginning photo) and a few sparse hairs stick out from under the overlapping edges. This is one of nature’s better tails! I didn’t want to correct the above-average pre-schooler quoted above, but the beaver’s magnificent tail is actually used more as a rudder than a swimming flap. 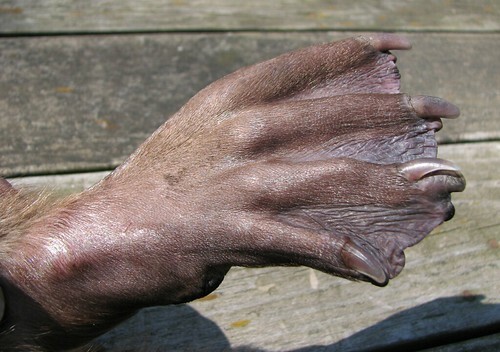 Huge webbed hind feet (see below) are responsible for propelling the beast through the water when swimming. The small front feet are held tight to the chest while swimming, but the back ones expand out to near human palm size when fully extended (see here). Incredibly, the second toe on each back foot is modified – the hard part of the nail is split into a flattened upper portion and a perpendicular bottom portion(see here). The purpose for this toenail is for fur combing and spreading water-repellent oils. As a cousin of the muskrat, the beaver shares many traits with it’s diminutive relative. A dense woolly underfur, beneath the tawny layer of oily guard hairs (see here), keeps Castor and his little cousin dry and warm in their watery habitat. Both species have stout golden incisors. While the beaver’s massive chisels are meant to chip away at wood and bark, the muskrat’s slender chippers are fit only for “felling” tender cat-tails. The lips on both species can close tightly behind the incisors to create a water tight seal (see here) when chewing underwater. Both water mammals have short ears (see “hear”) and nostrils that can be closed off when diving. A final point of similarity between the two is that both have very active musk glands. The beaver definitely takes this part of his being to the extreme, however. Sensing that I have probably brought you to the brink of your normal sensibilities, I’ll give you a break from this beaver talk and stop for now. I warn you, however, that I’ll be back in a few days with some serious Castor oil chat and a good close look at an insect that only lives on the backs of beavers! Stay tuned.